Bay Area Rapid Transit. Photo: Tak Yeung. 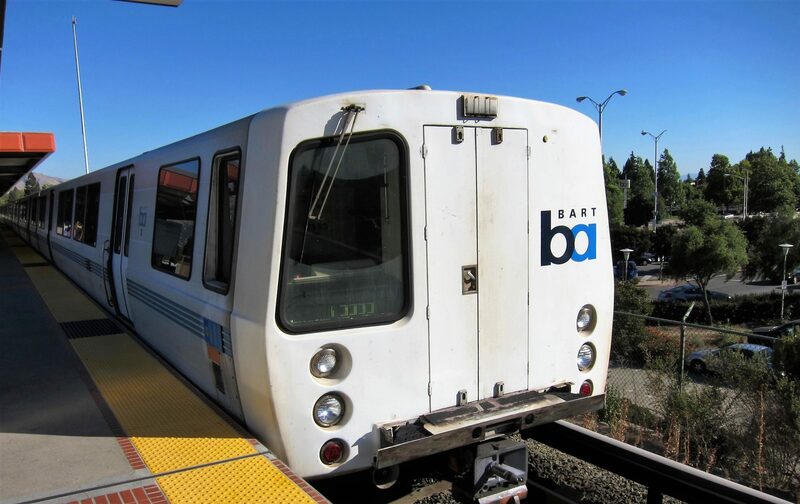 Funding has been secured to further plans for a new connection between the Bay Area Rapid Transit (BART) and Altamont Corridor Express (ACE) rail systems in California, the United States. 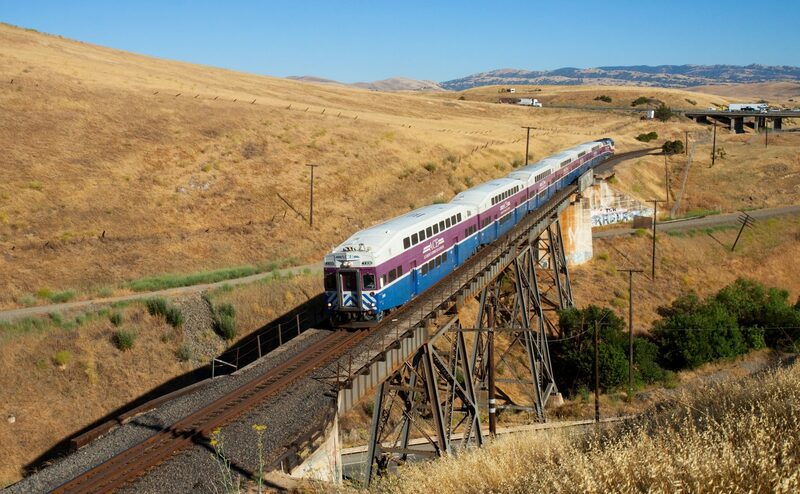 The recently founded Tri-Valley – San Joaquin Valley Regional Rail Authority has awarded a grant of $750,000 to progress plans that hope to ease congestion on the I-580 highway by introducing a new passenger rail service. 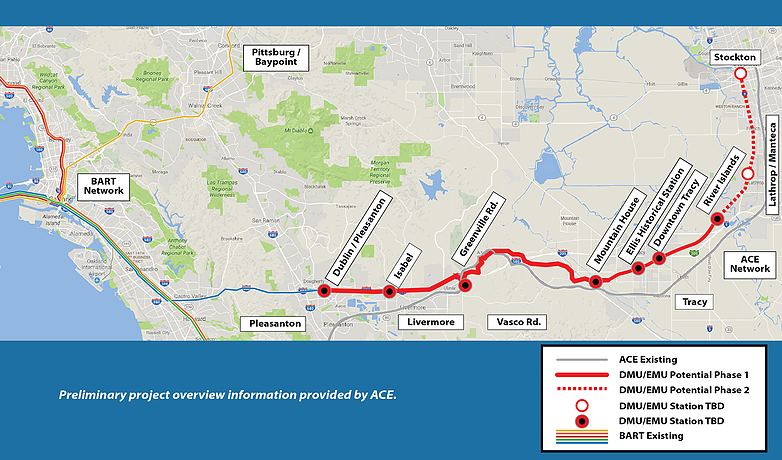 While other options will be studied, the rail authority’s adopted project concept envisages a first phase from River Islands, Tracy, Mountain House and locations in Livermore before connecting with a BART terminus (See map below). This would follow the path of the historic Transcontinental Railroad, a 12 mile abandoned route through the Altamont mountain pass. Photo: Tri-Valley – San Joaquin Valley Regional Rail Authority. Scott Haggerty, Alameda County supervisor and chair of the authority, said: “The I-580 freeway serves the Altamont Corridor and ranks as one of the most congested freeways in the Northern California megaregion due to high volume commuter, freight and other traffic. City of Tracy mayor Veronica Vargas, who is also the vice-chair of the authority, added: “The affordability of housing in Tracy and other Northern San Joaquin Valley communities is attractive to many residents who work in the Bay Area. The Altamont Corridor Express. Photo: Kabelleger / David Gubler. Next articleWhat next for bi-mode trains? Congested highways are responsible for so many accidents, shipment delivery delays, damages in vehicle transportation etc. hope this rail helps with the California roads.